In the third article of this four-part series about what makes IIT Madras a land of opportunities, we look at why IIT-M is India’s Startup University. The rest of the series can be found here. The Indian economy changed fundamentally in 1991 when a long-term economic liberalization process was initiated. An Indian dream, in many ways similar to the American dream, is beginning to take shape. A sense of confidence and positivity is directing many among the youth towards entrepreneurial paths. Innovation is critical to entrepreneurial success and the IITs have long had environments that are conducive to innovation. IIT Madras in particular, has been putting in place measures to position itself as a leading hub for entrepreneurship and innovation in India. Recent news reports have compared the entrepreneurial culture at IIT-M to that at Stanford University in the U.S., whose graduates have started companies like Google and Hewlett-Packard to name just two. So says Vignesh, a final year Computer Science Dual Degree student and one of the co-founders of HyperVerge, a Silicon Valley based startup working in the field of visual data. “After working at the Computer Vision Group of CFI for a couple of years on real-world problems with proven impact, we could not just not startup,” says Vignesh, leading him and four others to start HyperVerge. Like many of the startups emerging from IIT-M, they are housed at the Research Park. Startups need workspace, support and mentorship. The IIT Madras Incubation Cell and its sister organization in the Silicon Valley, IIT Madras Entrepreneurship Forum, consist of alumni dedicated to providing funding, along with the technical and business mentorship needed for a startup to succeed and thrive. It is currently incubating about 50 startups, much more than what was expected out of an incubation cell. Unlike many other incubation centres, the one at IIT-M has a professional team to provide legal and accounting advice to entrepreneurs, ensuring that a startup only needs to worry about what matters to them the most – their ideas. Such support is not restricted to any one field or market sector. The Rural Technology and Business Incubator supports startups developing cost-effective technologies that can be deployed in rural areas. C-TIDES is a business incubation cell which also doubles as a wonderful platform to share business ideas. The Center for Social Innovation and Entrepreneurship assists and catalyses development of socially beneficial products and ideas. The IIT-M Bioincubator, funded by the Department of Biotechnology (DBT), Government of India, is currently incubating four companies. One of them, for instance, is working on a device that can perform a battery of tests to diagnose diseases such as tuberculosis, malaria, and Hepatitis B. Once they’re up and running, these startups will be open to taking undergraduate students as summer interns. Based in the Research Park, the Bioincubator will have more office and lab space available once ongoing construction work is completed. But more significant would be the opportunities young entrepreneurs have for networking with mentors. 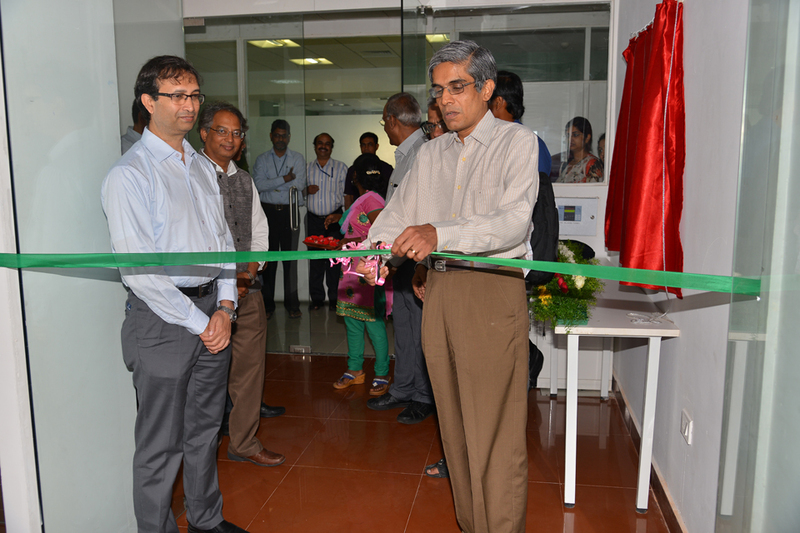 Prof. Bhaskar Ramamurthi, Director of IIT Madras, inaugurating the IIT-M Bioincubator, with Prof. Guhan Jayaraman. Any student with an idea has the opportunity to launch a startup, initially with a small amount of seed funding from the Institute or from alumni. “What I’d call a pre-incubation stage,” says Prof. Guhan Jayaraman, who is Project Coordinator of the Bioincubator. With the understanding that biotech incubation takes a relatively long time, students can also write for bigger alumni grants, or from the DBT or higher-stage funding from venture capital companies. In fact, Shrikumar Suryanarayanan, a Distinguished Alumnus, has announced a scheme to sponsor two biotechnology startup teams each year with ₹10 lakhs, who will also be given laboratory space and access to potential mentors in academia and industry. And they shouldn’t be short of ideas. Students in the biotechnology department get to choose from courses in computational biology and biomedical engineering, apart from electives across the board in other departments. There is also an incubation facility in the department exclusively for IIT-M students, who can work with suitable faculty – even faculty from other institutes – or people from industry. “The idea is that students don’t do their projects in a disinterested fashion,” says Prof. Jayaraman. Support aside, it takes tremendous courage and confidence for a person, or a team, to dedicate themselves to building an enterprise which may or may not become successful. Many ideas go unexplored when students, unsure of whether they can work full-time on their ideas, decide not to pursue them. “IIT Madras provides support for this as well with Nirmaan, a team of faculty members, students and alumni dedicated to providing support and mentorship while you work on concretizing your ideas without committing too much to building a startup,” says Prof. Ashwin Mahalingam, a faculty advisor at Nirmaan. The Entrepreneurship Support Scheme, for instance, which started in April 2012, is sponsored by various alumni and 20 startups have so far been funded through this scheme. Then there’s the Leadership Lecture Series, with three or four lectures every month, that aims to create more avenues for alumni and other industry leaders to interact and share their experiences with students. Final-year undergraduate students have the option to convert to an M.S. in entrepreneurship where they can work full-time on their ideas. “So the worst that can happen is that the idea fails, and the student can sit for placements while collecting their B.Tech and an M.S. 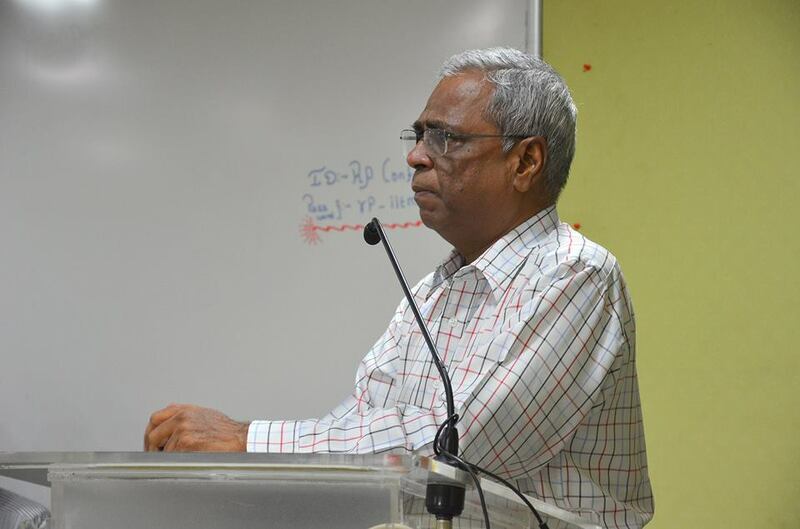 in entrepreneurship,” says Prof. Mahalingam. Apart from this, undergraduates also have the flexibility to take a semester off to pursue their ideas and safely transition back into business as usual if it doesn’t work out. The sheer number of safety nets and resources put in place by IIT Madras has enabled students to confidently venture into startups. But how does one get good startup ideas in the first place, you may ask. Most ideas come from discussions and teamwork. The Center for Innovation, CFI, practically breeds startup ideas. “It’s useful for a hardware startup to start from close to IIT-M. Outside the campus, timeline expectations, revenue and sales expectations have the potential to sidetrack one from development and tech work. The overall ecosystem in the campus, including CFI and Research Park is supportive of tech work,” say the founders of Ather Energy, an IIT-M startup working on a futuristic, smart and energy-efficient electric scooter which has already attracted more than a million dollars in funding. (T5E had profiled the founders of Ather Energy here.) Many academic projects which start out at one of several laboratories at IIT-M also end up as startups. Many of the facilities mentioned previously are also open to alumni. So students remain a part of the IIT-M family for the rest of their lives. All this entrepreneurial zeal derives from faculty members who think differently, which we certainly need to do if we are to cope with, and capitalize on, India’s burgeoning population. One of the most pressing needs is providing affordable housing for lower income groups. Currently, “affordable” usually means uncomfortable, cramped and sometimes unsafe. Glass fibre reinforced gypsum (GFRG), a new building material developed in the Civil Engineering department by Prof. Devdas Menon and his team, may change all that. Gypsum is a byproduct of the fertilizer manufacturing process, and is available in plenty in India. It is reinforced with glass fibres, and the resulting material is shaped into large panels. These panels can then be used to construct most structures required in a house, including the roof, floors, walls and stairs. The prefabricated nature of these panels means that construction time is minimized – a pilot project of four flats was built in the IIT-M campus in a month – and the abundance of gypsum results in building costs as low as ₹1250 per square feet. Tests and simulations have also shown that buildings made of GFRG are less prone to earthquake damage than conventional buildings. The success of the pilot project has encouraged Tata Housing to begin construction of a five-storied complex in Mumbai, with other projects in the pipeline. Now, all these homes need a power supply. Just producing more power isn’t enough; we must find ways of more efficient distribution too. Prof. Ashok Jhunjhunwala of the Electrical Engineering department first noticed problems with the existing system while supervising the setting up of solar panels on the roofs of buildings in the campus. The repeated conversion between DC (supplied by solar panels and stored by batteries) and AC (used by most appliances) resulted in power losses of over 40%. This led him to investigate the possibility of using only DC across the entire grid, and found that DC appliances were more efficient than their AC counterparts. He then proceeded to convert a number of offices, including his own, and hostel rooms to run on DC alone. In what would be a radical change in how power is supplied to, and used in, homes, Prof. Jhunjhunwala and his team are now planning to introduce these DC grids in various locations across India. Another challenge that India faces is providing quality, affordable healthcare. The Healthcare Technology Innovation Center (HTIC) at the Research Park is a joint venture between IIT-M and the DBT, Government of India. Since its creation in 2011, HTIC has brought together numerous medical institutions, industries and government agencies to collaborate and develop affordable healthcare technologies. It is a hotbed of interdisciplinary research and innovation, and offers opportunities to undergraduate students as well, in the form of summer internships and projects. Perhaps the most prominent system the HTIC has developed is its Mobile Eye Surgical Unit (MESU™), a stable and self-contained mobile platform that provides a sterile environment for performing high quality cataract surgeries in rural areas that lack basic amenities. MESU™ has been approved by the Ministry of Health and Family Welfare and has been used to conduct more than 1200 surgeries till date. Another system created at HTIC is Eye PAC™, an imaging technology that can diagnose ophthalmological conditions such as diabetic retinopathy using images of the eye alone. Living in such an environment of innovation, and with extremely strong academic grounding, IIT Madras graduates are the cream of the country and are pursued by the biggest companies, both Indian and global. To make this process easier, and to provide equal opportunity for the students, there’s a very structured placement program in place. IIT Madras’ culture of encouraging students to pursue their interests extends to placements too. There is no restriction on the variety or number of companies one can apply for. Core engineering companies that recruit IIT-M students include giants such as Google, Samsung, General Electric (GE), Honeywell, Qualcomm, ITC, Hindustan Unilever, Shell, and Airbus, while non-core companies include firms such as The Boston Consulting Group, McKinsey & Company, Goldman Sachs, Deutsche Bank, and American Express. Many students are inducted straight out of their internship with firms such as Hindustan Unilever, Shell, ITC. P&G, Cadbury, American Express, and Nomura. The strong collaboration between the industry and the Institute, nurtured by the Research Park, industrial consultancy, and various campus engagement events, play a big part in bringing in meaningful opportunities at different stages of a student’s life. In an active attempt to enrich the avenues available for students on campus, a career development centre will be launched this year that will cater to the diverse needs of students, be it applying for higher studies or bagging that coveted job during the placement season. There is already a Placement Office which is run by the faculty in coordination with a team of student volunteers. The core team for this is typically elected from different branches and they take the onus of reaching out to some of the biggest names in industry. Their work is supplemented by the Industrial and Public Relations team which reaches out to companies in the non-engineering sectors and also handles campus engagement activities. The faculty members also take a keen interest in the activities of the placement team and are quite serious about promoting the image of the Institute while protecting the interests of the students. With very strong senior-junior ties, the students have a wealth of information at their disposal to nab their dream job. This interaction lays the foundation for the strong placement scenario at IIT Madras. In the last of this four-part series, we’ll look at IIT-M’s efforts to achieve global eminence.